Teachers are always looking for new classroom management strategies. It doesn't matter how long we've been teaching. We're always looking to improve our classroom "vibe" and we work hard to try different strategies in order to find the ones that work best for us and our students. For a long time, I believed that a noisy class meant that kids are "actively involved in their learning". After many struggles, I have learned that this is not always the case. Yes, kids need to move around and they need the opportunity to discuss with their peers. It's important that students are given opportunities to get up, ask questions, and explore. However, there is such a thing as an effective classroom that is also quiet and calm. 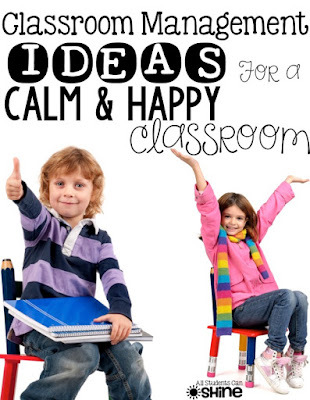 So many students need a calm environment in order to stay focused and feel successful in school. Finding a balance between a "noisy classroom" and a "quiet classroom" is key. Teachers need to get to know their students' needs and adapt by managing their classroom in a way that works for everyone. After all, reaching all your students' needs will give them each a chance to shine! 1. Walk around the room. Whether your students are quietly working at their desks or are sitting with their center groups, walking around the room is so important. Keep them on their toes by circulating constantly. If you stay seated at your desk while kids are working independently, they will be more likely to get off task. Walking around the room and making your presence known will help kids become aware that you are there for them when they need you. Students will feel comfortable asking for help because they will not have to get up, out of their seat, to find you. 2. Ask your students for feedback. Ask your students for feedback about everything you do. When you give a lesson, ask for feedback to find out if they understood the new concept. When you are assigning a new project, ask for feedback to make sure they know what is expected of them. Student feedback helps us track their learning and our teaching too. Instead of pointing out what is wrong with your class, try doing the opposite and having good behavior stand out. Most of the class will want the same kind of attention and will work toward it. So often, behavior problems are due to children not knowing what is expected of them. Before sending kids to their seats with an assigned task, check to make sure everyone knows what to do. Have them repeat your instructions back to you or have them repeat it to the person sitting next to them. This will avoid many disruptions during independent work and you will have more time to spend on positive things (rewarding students) rather than negative (reprimanding). 5. Give kids a chance to talk. 6. Use more than one behavior system. Some kids work really well with independent behavior systems. They know what is expected of them and they do well with their points system. Other kids are motivated with group points because they are team players and like to work with others to achieve a goal. It's important that you give everyone a chance to shine in your class. The best way to do this is to have more than one behavior system at the same time. Try a few: whole class, small groups, individual, outside (recess and lunch), campus, etc. Giving plenty of opportunities for kids to succeed is key. Just don't implement them all during the first week of school! I recommend starting with one or two at a time and adding or removing them as needed. Don't be afraid to completely change your behavior or reward systems in your class, even if it is the in middle of the year. Kids are very flexible and enjoy change, as long as it is introduced properly and is structured in a way that makes them successful. Keep constant communication with your students' parents throughout the school year. Whether you use agendas to write notes, or apps like Class Dojo or Remind, you need to make sure your students' parents are aware of their child's accomplishments and difficulties. Many times, a short talk with mom or dad is enough to help a child change his/her unwanted behavior in the classroom. When kids know that their teacher and parents are on the same page and are communicating regularly, they tend to become more motivated to work hard and behave appropriately. 8. Make interactions less than 10 seconds. Avoid lecturing. Kids don't listen to that. By the way, they don't listen when they are being yelled at either. Instead of lecturing a child for 5 minutes, make your message short and clear. Try sticking to closed-ended questions (yes or no answers) and treat every child with respect. Making your interaction short will avoid an argument and will encourage the child to get right back to work instead of prolonging the unacceptable behavior. Here is an example: A child is fooling around at his desk. Walk over to this child, put your hand on his shoulder and say "in our class, do we stay on task the whole time, yes or no?" When the child responds with a "yes", thank him/her and walk away. Thanking a child for making the right decision helps the child feel respected and can go a long way. I hope some of these tips stood out for you. Let me know which ones are your favorite! 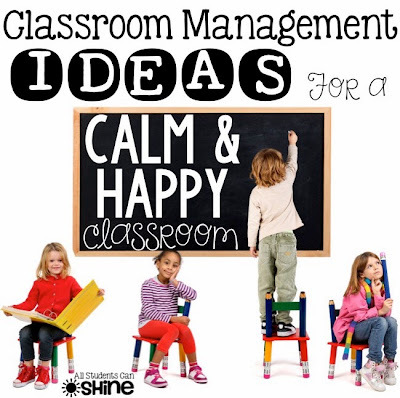 What are your classroom management ideas? I'd love to get some new tips from you! 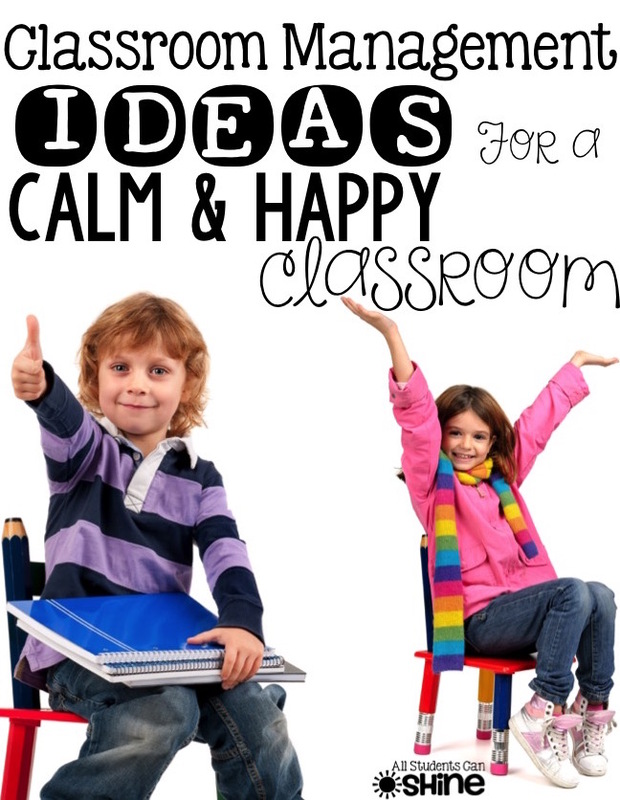 Leave me a comment below with your ideas for a calm and happy classroom. One thing that REALLY helped my classroom was getting feedback from the students! I would often ask how they felt during the lesson, if they felt confused, and what they'd like in the classroom! It was a way for them to take ownership in the classroom and it took my class that often was talking off task to discuss our lessons regularly, even outside of class! Great Ideas!! I especially love #6. I think it is important to have different systems in place since all students have different needs and they do enjoy the change from time to time!! Asking children to respond during a lesson with a hand gesture (maybe fist to five) is a good way to find out who is a bit shaky on the concept being taught. Following you with the question, "what do you already understand, validates the child's effort and thinking so far and gives them a comfortable space to ask a question without feeling dumb. I think thug have to be careful with praise. I have changed from "good job" to "great effort", "you're really persevering" in order to stress the process rather than the product. I came across some research that showed that commenting this way encourages children to take more risks, persevere to finish problems, and increase their stamina all of which have a greater effect on their learning.